Collapsing sand kills more people than sharks. A father-son team examined reports of deaths due to accidents involving sand, typically at beaches, and found that in the period from 1990-2006 16 people died from sand holes while only 12 died from shark attacks. The danger lies in a victim being buried by sand when the walls of the hole collapse inward. For shallow holes this isn't a problem but a teenager died when he fell into a deep hole dug by another beach-goer. Rescuers made the problem worse when they caused the sand to fall inwards, burying the boy for several minutes. Ironically this danger is virtually unknown. This is probably because shark attacks and other similar threats are more exciting; Spielberg's movie was called "Jaws", not "Sand", and even the movie "Dune" didn't feature collapsing holes. Yet the math shows the truth: more people die in sand accidents than shark attacks. And you thought you were safe if you stayed out of the water. Hans bought books about murder investigations, found in his car after Nina disappeared. Blood was found in Hans's car and one car-seat was missing, which Hans has yet to explain. His ex-friend, allegedly Nina's lover, confessed to killing 8 people (but not Nina) before becoming a Christian and leaving his evil ways behind. Hans's children were removed from his custody and given over to Nina's mother, who has taken them to Russia and refuses to return. Wired has an interview with Hans here. 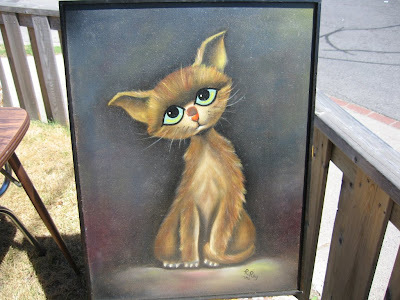 There is also a blog dedicated to freeing Reiser. I bet someone is already working on the Law and Order screenplay. A friend sent me the link to this game. It's pretty addictive. The idea is to move the block into the hole. There are various twists, such as buttons that raise/lower bridges, floor-plates that collapse if the block stands on end on them, and floor plates that split your block into two and teleport the two halves somewhere else. It makes for a nice challenge with a few simple concepts. You can even "save" your game by writing down the passcode in the upper-right corner of the screen so you can return to that stage later on. This game is not safe for work because of the number of hours you will lose playing it. Roy L. Pearson sued his dry cleaner when they lost his pants. He claimed they initially tried to give him grey pants, when his were maroon. He then claimed that the store violated his consumer rights because they advertised "Satisfaction Guaranteed". The damages claimed: $54 Million. Thankfully, the judge in the case found against Mr. Pearson and ordered him to pay the defendant's court costs, and it's possible that he will have to pay the defendant's legal bills as well. What I find most surprising about this case is that the plaintiff is actually a judge himself. Sure, we're talking about the US legal system, but I'm surprised that a judge doesn't have more sense than this; surely he should have realized that his lawsuit was ridiculous? Well, the dry cleaners lost his pants, but now he's lost his suit. 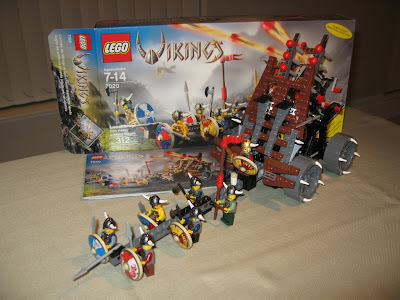 For Christmas I received a LEGO kit, number 7020, which is the "Army of Vikings with Heavy Artillery Wagon". This kit is truly the prime Viking army builder, in terms of number of minifigs and variations among them. The Chess set has the most figs in one box, but in that set they are rather uniform in appearance, while in this set they all look different. The set itself contains 312 pieces. Each minifig is 6 pieces (leg assembly and torso assembly each count as one piece), including helmets but not including weapons. There are 9 weapons, 5 shields, one 4-piece flag, and 7 figs total; this accounts the first 68 pieces; the rest are devoted to the heavy artillery wagon. I'm not sure if Vikings were known for artillery, and in fact I question the historic accuracy of this entire kit, but there is something to be said for the huge wagon that comprises the primary model for this kit. It is basically a black frame, made of technic pieces, with a brown and grey "wooden" front, and a strange-looking apparatus behind the facade. This contraption is actually a double-barrelled rapid-firing ballista. There is a crank at the back of the wagon which causes a red paddle to flip down on a spring-loaded piece, which snaps back and launches a missile out the front of the wagon. There are ten rounds and this thing can fire them off very quickly. Overall this set is quite good. It has many useful parts, and a large army, and it serves as an excellent model for young builders to hone their artillery-building skills. The technic pieces can be re-used to build more historically accurate wagons or, more likely, to build other kinds of shooting weapons. The Vikings would have loved to have had this back in the middle ages, I'm sure. It is great fun to watch an army of minifigs get decimated by what is essentially a machine gun. So there we were, on the island, gathering by the shore for the long ride back to the mainland. Something didn't seem right, but that didn't stop the animals and people from climbing right into the whale's mouth. Even the whale's mouth was strange: it didn't open forward, like a whale's mouth usually does, but sideways, like the doors on a DeLorean. The whale just sat there, patiently, while everyone piled in. I watched as the animals and people just climbed in, and tucked themselves into nice neat rows. The ride to the mainland was estimated to take several days. I pondered this as more and more creatures climbed into the whale's gullet. I started to wonder how the animals and people would breathe. I didn't know if whales can breathe through their mouths like humans can. I suppose they might be able to. But still the situation seemed odd, and that's when I looked into the whale's eye, and understood his plan. Not content to ferry us to the mainland, then let us off, he was going to close his mouth and those inside would never be seen again. "It's a trap!" I shouted as the impending treachery dawned on me. "Don't go in there, he's just going to eat you all!" Frantically I shouted and waved my arms to alert my fellow travellers before they too were swallowed by Jonah's Bane. Suddenly the whale's mouth slammed closed. The look of pure anger in his eyes will never leave me as he departed with only half his treasure. 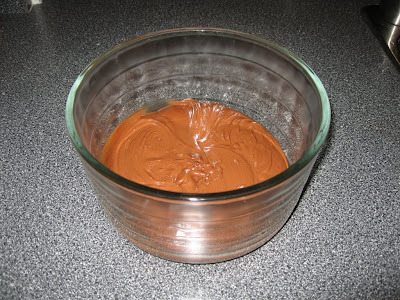 At Christmas and other special occasions I like to make this chocolaty treat. These truffles are rich and decadent. Made from chocolate, butter, sugar, and rum, what's not to love? They're simple to make but your hands will be messy and the process is time-consuming. I usually double the recipe. Melt the chocolate. I use the microwave for this. The recipe calls for cooling the chocolate but I usually just do this first and let it stand until I'm ready for the next part. Cream the butter; blend in the egg yolk and sugar. Add in the chocolate, coffee, and rum. Mix well. Chill until it is firm, about 3-4 hours. 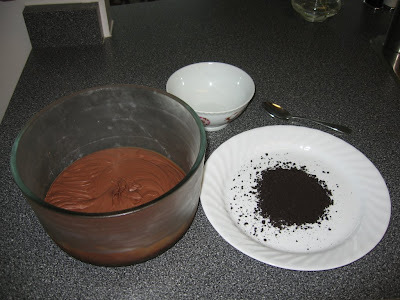 Spoon out mixture into chocolate crumbs to roughly coat the mixture so it doesn't stick to your hands. Form each spoonful into a ball-shape or any other desired shape. Roll the ball in the wafer crumbs to coat thoroughly. 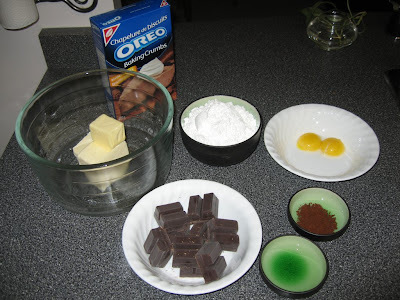 Drizzle with additional melted chocolate if desired. Chill completed balls for 2 hours. Store refrigerated or frozen in an airtight container. 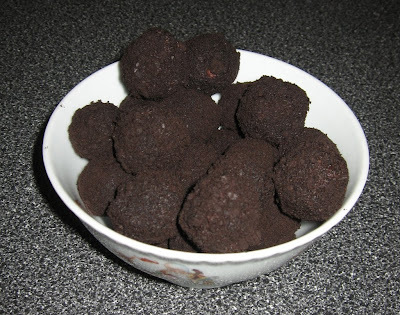 The truffles will soften at room temperature so if you're serving them in a hot room a chilled bowl might be advised. At one party I just put ice cubes in a bowl and put the truffle bowl into the ice bowl; that worked well. As I was reaching for a pair of Q-Tips in the morning, which I use to keep my ears clean, I was surprised to find a bonus new product from Unilever in my washroom. It seems they are beta-testing a new variant of Q-Tip or something. I thought I'd give it a whirl. Normally I use a regular Q-Tip, as seen below. The standard Q-Tip has a paper handle with a cotton swab at both ends. This gives unparallelled ear-cleaning convenience. Each end gives you a tiny comfy pillow with which to banish excess ear wax. The new Q-Tip has one cotton-swab at one end and what I can only imagine is a precision ear wax scraper at the other end. I used one of each to compare. The normal Q-Tip was quite good at cleaning my left ear. I used one end to clean around the outside of the ear canal and flipped the Q-Tip over to dig out the extra wax. The process was done in a few seconds. I tried to repeat the process on my right ear with the beta Q-Tip but found the precision-scraper end to be very uncomfortable. It didn't do a very good job of cleaning ear wax at all and left my ear feeling sore. I had to get another Q-Tip to finish the wax cleanup. Overall I rate these new Q-Tips at 1 out of 5 stars. The classic cotton end is as useful as ever but the new precision end just doesn't work well at all. My recommendation is to stick to your normal Q-Tips or other cotton swabs. I bought a new keyboard for my computer because my old one was dirty. Well, also I wanted some more buttons on the keyboard, because I like the extra buttons my work keyboard has. 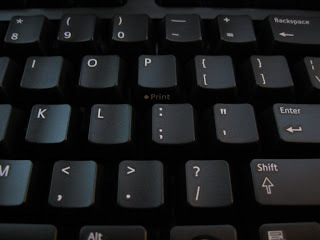 Unfortunately the keyboard manufacturers have decided that new keyboards should have a different layout than old keyboards; they have changed the Insert/Home/Del/End/PageUp/PageDown layout so that instead of two rows with three columns, it's three rows with two columns. This annoys me to no end, as does Microsoft's newer keyboards where the function keys are in groups of 3 instead of 4 (on those keyboards the "function" doesn't even work unless you turn on "function lock"... yeesh). Anyway, my obstinate need for an old-school layout limited my choices of keyboard to the Logitech 350 USB ("I bought this keyboard because I had no other choice," he said. But you could also read it as: "This was the best keyboard I found, no other would meet my high standards"). The keyboard itself is nice, for a cheap $20 keyboard. It came with a mouse, which I will discuss later, and thus for that price you can easily justify replacing your old hardware with new gear that looks sleek (because it's black instead of beige). The keys on the keyboard feel nice and it is relatively quiet. There isn't much to say for or against the keyboard; it has 104 standard keys, in the traditional layout, and it also has eight special keys, for launching common programs and controlling the sound/music. 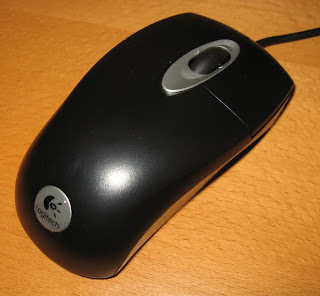 The mouse is a basic wheel mouse with a slight twist: the mouse wheel can tilt left and right, for left/right scrolling. Otherwise it's a simple mouse with two buttons. The mouse feels smaller in my hand than my previous mouse, which will take getting used to, and the mouse wheel is very hard to click as a third button compared to my old mouse. We'll see if I keep this mouse or go back to my classic Wheel Mouse. One other advantage the new mouse has is that it works better on a bare surface than my old mouse. Some optical mice work poorly on some surfaces; my Microsoft mouse at work hates mousepads and my Wheel Mouse hated my desk at home; the new mouse seems at home on my desk or on the mousepad. The hardware is fine, but unfortunately it seems that for this el-cheapo keyboard Logitech has decided that users will never need to customize the functionality of the extra keys. The extra keys are split, four on the left and four on the right. On the right are the application-starter keys with icons under them: a music note, an envelope, a house, and a calculator. These keys are hard-coded to open your system's default media player, your system's default mail client, your system's default browser, and windows calculator. On the right are the four keys that control playing/pausing music, and volume down, up, and mute. It's natural that the play/pause and volume controls would be hard-wired but lots of people would like to re-program the four program starters. I, for one, never use the calculator and would rather have some other program bound to that key. Also I don't use the default mail application, and lots of other people don't either; I use a remote mail application and lots of people use Gmail or hotmail or something similar. These people are not served by a mail button that starts Microsoft Outlook Express. Finally many people have some utility program that they use often, like notepad, which isn't one of these four blessed applications. Is it too much to ask that we can change what these buttons do? My keyboard at work is an older Logitech Internet keyboard and it can re-program all the buttons. The situation isn't made any better by the fact that the Logitech software which ostensibly lets you configure the keyboard doesn't actually show any configuration options: the only tabs on the display are for the mouse and the "help" and "taskbar icon options". Real friggin' useful, Logitech. 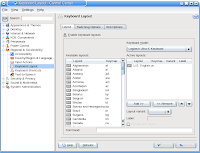 The help file for this software (it's called SetPoint) talks about how to reprogram the buttons, and indicates that there should be a keyboard tab on your settings page, but no such tab appears in the software. It's like they're taunting you with what you could have had if you hadn't bought the cheap keyboard. You don't need the software to use the mouse and keyboard, but you do need it to use the extra keys or the tilting mouse wheel. My verdict is that the software for this keyboard gets zero stars. Thankfully, Linux is where I spend most of my time and there are zillions of ways to configure the buttons. I think I'll configure the "calculator" button to launch Solitaire. Tomorrow's post will detail the Linux configuration for this keyboard. I think the people who live upstairs from me play the same game as Joel Spolsky's upstairs neighbours. It's amazing how often people drop things, things that rattle and skitter across the floor. You don't notice it if you live in a detached dwelling, but in an apartment you become well-attuned to your neighbours' noises. I like to try to determine what my upstairs neighbours are doing based on the sounds they make. There is one noise, which sounds to me as if it is coming from their master bedroom (their unit has the same layout as mine), that sounds like "TICK! Tick tick tick tick tick tick tick tick!" The only explanation that makes sense is that they sleep on a giant roulette wheel, and the sound we hear is the ball bouncing around the wheel until it comes to a rest. 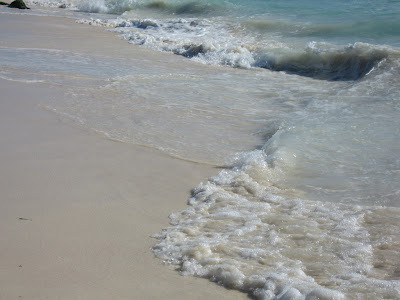 Another noise we hear, sometimes, is the sound of water running. I'm not talking about a faucet in a sink or someone flushing a toilet, or even filling a bathtub; it's more like someone draining a bathtub by picking it up and pouring it into another bathtub. The volume of water involved and the length of time precludes anyone but Bob McKenzie from urinating that long. Given that this only happens around 3:00 AM I can only conclude that they are harbouring an escaped killer whale, or perhaps a mermaid, and they are trying to keep it wet without attracting too much attention. There is a security camera in the pool area or else I'm sure they'd just use that. The last mystery sound is the strange alarm noise that plays constantly. It sounds like "BEEP beep beep beep beep". One long beep followed by four shorter beeps. This is not a typical clock radio alarm, and it doesn't sound at predictable times, as an alarm would. I hear this alarm every day, throughout the day, weekday, weekend, middle of the day or middle of the night, rain or shine. The alarm sounds at random times; sometimes several hours of silence will elapse between episodes, and sometimes it sounds off multiple times in a few minutes. I did some googling and found that the only product that makes such a beep is a perimeter alarm, used to alert people when someone, or something, crosses a boundary that should not be crossed. The boundary in question, in this case, is the perimeter near the whale/mermaid pen, and the thing that shouldn't cross the boundary is a pet narcoleptic sleepwalking hamster. The poor little thing falls asleep and wanders off, and it's well known that mermaids and orcas will eat hamsters if they approach too closely. It's good to see that people still care for their pets in days when it's often cheaper to buy a new pet than to feed your existing one. Even with the mystery of the noises solved, it's still annoying to listen to them. Studies have shown that noise increases stress; This is why I'm planning to fill their entire apartment with shaving foam, or perhaps sprayable cheese, in order to sound-proof it. I'm sure their other neighbours will thank me. The real estate market in Toronto is crazy these days. You can't get a house without making a firm offer, i.e. no conditions on financing or home inspections. A home inspection is a routine affair these days; it protects buyers from unexpected problems. However, in Toronto the housing market is so hot that many sellers are turning down offers that are conditional on a favourable home inspection. For a buyer unwilling to take the risk the only other option is to pre-inspect, and risk losing your $400 inspection fee if your bid is rejected. Not only that, but buyers are demanding a "good faith" deposit of at least 5%. That sort of money used to be the entire down payment for a lot of people; now that is the entry fee before an offer is considered reasonable. The sellers want to be able to keep this deposit if the buyer reneges on the offer after the deal is sealed. Demanding sellers are also not making things easy for prospective buyers. The latest craze is the multiple-offer scheme. The seller states that they will not accept any offers until a certain date, forcing all prospective buyers to bid against each other at the same time. This turns every home sale into an auction. This makes sense but sometimes the time-frames are ridiculous: I've seen houses appear on the market on Friday, with offers to be presented Monday evening. Given that you need to go see the house, then possibly arrange financing, and at the very least scrape up a certified cheque, this is not much time; never mind that it's basically impossible to pre-inspect the house under those circumstances. Even a seller who appears to be honest can still double-cross you. I recently looked at a house that was doing a multiple-offer setup but was showing the house for a week before offers were due; the seller even did his own pre-inspection and the results were available for potential buyers to peruse. I had a good feeling about this home, because it showed every sign of being an honest deal. The property was nice and well kept and in a good location, and the price was reasonable. Granted, the asking price was several tens of thousands lower than it should have been, but in a multiple-offer situation this is normal. It should have been a pleasure putting in a bid on this house, except that I didn't have a chance, because the seller changed the offer date and called some of the agents who had shown the house and made them present early. This behaviour is completely dishonest and shameful. In the end the buyers overpaid, in my opinion, and this is likely due to the machinations of the seller. I received my LEGO Vikings Chess Set from LEGO. It comes in a nice, re-usable box and includes 32 chess-pieces, 24 of which are minifigs, and a chess board. This set departs from traditional LEGO in that it is not intended to be a building toy. This set, with its sturdy box that doubles as a carrying-case, is intended to remain together as a chess set, not a bunch of parts that make up a chess set. The set arrives fully assembled and ready for battle. The chessboard squares, made up of 4x4 black and white plates, are glued to the 32x32 white baseplate. The rooks are completely glued except for the shield on the front. The square plate on the base of the knights is glued to the 2x2x2 slope. The 2x2x2 slope 'skirt' of the queen is glued to her torso. The Viking horns are glued to their helmets. The glue is important, however, when you consider this set as a chess set rather than a building toy. If the rooks were not glued together, or the queen's skirt was not glued to the torso, then when lifting the chess-piece from the board the piece would come apart and half would remain pegged to the board. This is especially true of the queen; the slopes often used as skirts in LEGOLand have normal studs on top, but a minifig's legs have elongated studs to better bind to the torso. It would be difficult to move the queen around without tearing her in half every time. Hence I pardon LEGO for this otherwise heinous crime of gluing pieces, since it would appear to be warranted in this situation. Given that the pieces are glued, it's important to note that people wanting a horde of regular Viking minifigs won't be disappointed. The 22 male minifigs are all normal figs, with nothing glued but their horns. 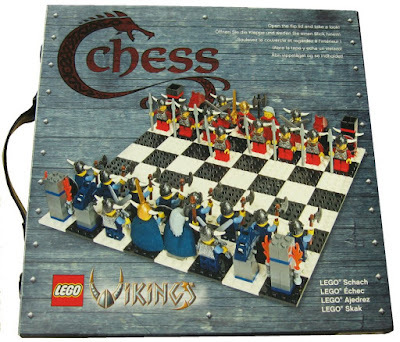 Ironically the Viking helmets in the chess set are no better at staying on the fig's heads than the other Viking helmets in other kits; I find it funny and a little disappointing that LEGO glued the horns to the helmets, when these do not fall out as often as the helmets fall off. But the Viking helmets look silly with no horns and so these glued horns do not detract too much from the set's value. Worse in my opinion is the use of the Knight's Kingdom Sword, which looks about as anti-viking as a sword could be. This awful sword is the bane of every Viking set. LEGO seems to have realized their mistake on that count and the new Castle line brings back the broadsword and greatsword, and so I won't berate them further on this topic. Other than the glue, which is unavoidable, and the Knight's Kingdom swords, the set is quite good. The chessboard is a plain, black and white board, with velcro on the back to hold it in the box when it's not in use. The minifigs fit into a molded plastic housing where they glare out at you. The box folds closed and has plastic straps to snap it shut. The blue team, pictured above, is fashionably attired in dark blue pants and shirts, with light blue sleeves. The queen has a dark grey torso with dark blue sleeves. The king and queen have dark blue capes; this is the first set to contain these capes. The king and two rooks have black shields with a blue sticker on them. In the photo above the pawn is on the left, wielding a short axe. The knight is beside him, then the king, with the ridiculous Knight's Kingdom sword; then the queen with a double-bladed two-handed battle-axe, then the rook, with two torches, and the bishop, with crossed swords. The read team, pictured above, is similar to the blue team with some minor differences. First, the men are arrayed in a different dark grey torso with dark-red sleeves but sport bright red pants. The pawns carry spears instead of axes, and the rook is topped with this piece which makes the rook more reminiscent of a tower than the blue rooks. Unlike the blue queen, the red queen has the same torso assembly as the other red soldiers. In the photo above the pieces are arranged, from left to right, as follows: pawn, rook, queen, king, knight, bishop. All four bishops have the same head, and the 8 pawns on each side have the same head, and the two kings and two queens share heads as well. This is fine for a chessboard but if these figs leave the board to mingle with your other Viking figs it will be reminiscent of the days when all LEGO figs had only one face: the smiley. I think this set makes a good chess set, for a kit put together by LEGO (as opposed to one made by fans). The pieces look good and don't suffer from the Knight's Kingdom chess set's awful colour scheme. The construction of the box, which is intended as the permanent home for these pieces, is reasonable; both sturdy and handsome. My only criticisms aside from the glue and the swords: The pawn pieces are the same height as the other pieces, and the bishops don't look bishopy enough. In a traditional set the pawns are shorter than the stronger pieces, especially the bishops which often resemble the pawns in appearance. Unfortunately solving this problem would require either making the chessboard smooth or gluing some assembly to the base of the minifigs; neither of these is an ideal solution. For the bishops, however, I think it would be reasonable for them to have a different torso and a taller weapon. The double-bladed battle axe the queen has would be ideal as the bishop's weapon as it resembles a crosier... well, maybe not but it's much closer than the crossed swords. Thankfully this is LEGO and I can re-outfit the troops as needed from my existing collection. As an army builder this set is fairly good but the main issue is the lack of variety; Viking hordes are not know for their uniform appearance and thus this set is not historically accurate. For me the ideal chess set would include a fully-brick-build chessboard that doubles as a carrying case; the board itself would be made of smooth tiles instead of studded plates, and the chess pieces would be taller and nothing would be glued. However this would probably add 200 pieces to the kit which is already fairly pricey so I can understand why LEGO chose this approach. LEGO has stated that minifigs are the most expensive components of a kit and this kit is pretty much all figs, so it's understandable that they have to compromise to keep the price down. I think they did a good job on this set. Here's hoping they continue with the chess line with the 2007 Castle theme, or maybe some other theme, such as pirates or space. It seems that a school in Norway has decided to mandate that the boys sit on toilets when peeing. The reason, it seems, is that the toilet stalls in question are shared between boys and girls, and boys are not good at aiming. Sadly I can attest that many men are bad at aiming and do not clean up after themselves. But the funniest thing in this whole saga is that Vidar Kleppe, the chief of the Democrats Party, is outraged about this decree and claims it is interfering with God's work. "When boys are not allowed to pee in the natural way, the way boys have done for generations, it is meddling with God's work," Kleppe said, "It is a human right not to have to sit down like a girl." Somehow I doubt Amnesty International will be writing up the school for human-rights violations. I recently bought a W810i from Rogers. It's a pretty nice phone; after using it for a couple months I find that I am generally happy with it. Usability-wise I find few major issues (but several minor ones). This is part one of my review, in which I discuss what I like about the phone. The phone started off on the right foot with the packaging. It has one of the most elegant boxes ever; everything inside is nicely bundled in sleek black boxes that all fit together, and the phone sits in the middle like a show-piece. Compared to the iPod Nano, which has this ridiculous plastic case that's smaller on the inside than its contents, the W810i box was easy to open and it was easy to get the goodies out and back in again. I don't like destroying packaging just to get at the product and this box sure won in that dept. Once I started using the phone I was generally happy with the features. Nothing really surprised me except the playlist sorting flaw (which I will discuss later). The phone has lots of options, ranging from wallpaper, ringtone, colour theme, to how long the infrared or bluetooth ports are on, and whether or not the phone auto-locks the keypad. I found that the options were reasonably well organized and generally made sense. The only strange thing is messaging has its own options section which is separate from the main settings area. As far as basic usage of the phone is concerned, there is nothing to complain about. The menu is very responsive; there is nothing strange involved in making a call, just dial and click "call"; you can easily see your outgoing, incoming, and missed calls; the indicator icons for things such as new text messages are easy to see and understand; the phone can vibrate and ring at the same time (not all phones can), and the phone tells you the time even when it has no signal (my old Audiovox phone could do neither of these two latter features, which is why I mention it). The phone has a button which starts the Walkman application, which is the #2 feature (or maybe the #1 feature?) of this phone (the other main feature being making calls, of course). The Walkman application lets you play movies or music (no Ogg Vorbis, sadly) but I only use the music feature. This is flawlessly integrated with the phone: when you are listening to music and a call comes in, the music pauses and you can answer the call, and when the call is done the music resumes. You can play/pause the music with an external button and also control the volume and skip tracks, even when the keypad is locked. When there are no headphones, the music plays on the phone's rear speaker (the same speaker used to play ringtones). This speaker doesn't have great quality but it's still ok for a bit of casual listening. The headphones that come with the phone are the in-ear type, the kind you push in until they touch your brain. They are fairly comfortable to wear and small enough to put into your pocket when not in use. The phone also supports FM Radio, which is integrated as well as the walkman app. In fact the play/pause button will play either the radio or the walkman depending on which app was last used. That's convenient. The phone ships with a 1 GB Memory Stick Duo, which is a cute little Sony-proprietary memory card, but Rogers was having a promotion when I bought the phone so they mailed me a 4GB card. This makes the phone a very compelling MP3 platform, except for the audio issues. The phone also has Java (J2ME) installed, and unlike some phones, it loads quite quickly and is very responsive. I was apprehensive about Java on phones but I find it to work very well. The J2ME apps load faster than the built-in web-browser, actually. I downloaded DoomRPG and spent some time blowing up pixellated Imps. The phone comes with 4 games but two of these are pure demos: play for a few minutes and the game ends, while the other games are limited in scope but fun to play. The phone comes with a USB cable that is capable of charging the phone, as well as a dedicated charging cable. The USB cable doesn't charge the phone as quickly as the dedicated charger, but it does let you copy files to/from a PC, as well as synchronize your phone's contact list and use the phone as a modem. The modem feature is useless to me so I haven't tried it, but on paper it's a fantastic idea. As for file transfer, the phone shows up on the PC as two mass-storage devices, one for the phone itself and one for the memory card. This is very handy, both for adding MP3s and for general file storage. 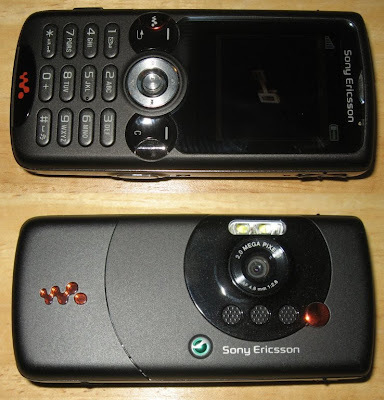 The phone is also equipped with a 2 Megapixel camera. This camera has a light, which is almost as good as a proper flash, and it can focus to a limited extent. It also has basic zoom capabilities. I found that it doesn't replace a regular 2MP camera, but for a phone it is a very good camera. The pictures are conveniently stored on the memory stick making it easy to get them onto the PC either through the USB cable or using a card-reader. No need to rack up data-charges by sending the picture via email. Tune in tomorrow when I'll discuss what I don't like about the phone. There is a company that is trying to patent software security patches which are developed by third parties. This is either the worst idea ever or the biggest joke on the patent system. In essence they want to patent the solution to a problem, then charge people to use that solution, even though the "invention" in question isn't really a new thing but fixing the absence of a thing. It's like if someone invented a new lock, but accidentally made the deadbolts out of marshmallow, and someone else came along and tried to patent making the deadbolt out of steel. The original invention called for steel, or something strong, but an implementation flaw lead to poor security. But now this new company comes along and says, "Aha! If we replace the marshmallow.... perfect!" as if it weren't completely obvious what's wrong with the locks. If this company gets any patents for this nonsense, and actually wins in court, it will be proof (as if more proof is needed) that the patent system is fundamentally and completely broken. I broke my shoe-horn. This is actually the second one I've broken. The other one was the same as this one and it broke in pretty much the same way. Of course when a shoe-horn breaks it's because you're trying to jam your foot into a shoe and there's a lot of weight on it, and you're holding it, and suddenly you're holding half a horn that's really just a plastic shard cutting your hand, and you're putting lots of weight on THAT. Not a good way to start the day. I went to the mall to see what I could find in terms of a replacement. I visited a shoe store, the first one that I found when I entered the mall, and asked if they sold shoe horns. The clerk replied that they do not sell shoe horns, but they do give away freebies. He handed me one from a bucket full of shoe-horns. I thanked him and left. The shoe-horn he gave me was not as rugged as I had in mind, so I went from shoe store to shoe store, looking for the right horn. The story was the same everywhere: they didn't sell shoe horns, but they did give them away. 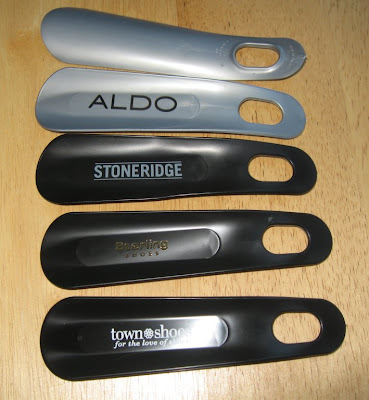 A couple stores didn't have shoe horns at all, and one sales clerk didn't even know what a shoe horn was. Kids these days! I was tempted to tell her it was brass instrument, vaguely like a trumpet, only shoe-shaped. There were a couple duplicates, from Aldo and Spring, but as you can see the horns are of three basic types. The most popular type is the one I'll call "Long and Smooth", the second most popular "Short and Flimsy" and the third type, represented by a single horn from Capezio, "Square and Thick". These horns, which came from Aldo, Stoneridge, Sterling Shoes, and Town Shoes, are a basic all-purpose shoe-horn All horns represented here have a hole in the end, ostensibly for hanging the horn up when you're not using it. For the Long and Smooth horns this hole is quite large, and is situated where the thumb and fingers usually hold the horn as you're putting the shoe on. This weakens the top of the shoe-horn a bit and when I used this horn I could feel the plastic bend somewhat. However the horn has an overall pleasant shape and works well. The plastic itself is a little flexible, so it should bend before it breaks, but overall it does not feel strong enough for my needs. I received three of these horns, two from Spring and one from Feet-first. These horns are quite short, so they could maybe fit into a purse if a woman needed to bring a horn with her. No man can use this horn, however, because they are absolutely incapable of withstanding any weight at all. When using this horn the horn nearly bent in half as I tried to slip my foot into my shoe. Only a small person whose shoes can already slip on and off could use this horn. This horn is the same shape as my original shoe horn. 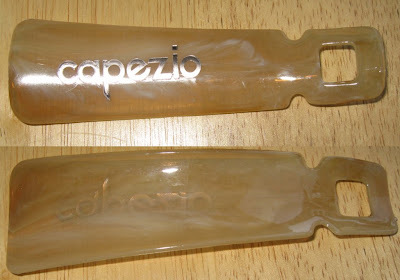 This horn came from Capezio shoes; it is a practical size and decent thickness. However the hole at the top is prone to breaking (both my original Browns Shoes horns broke here first). 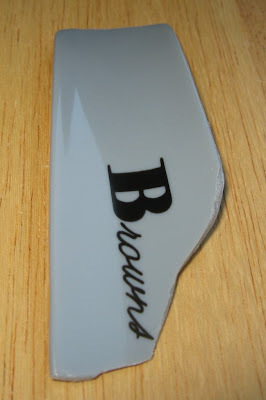 This horn differs slightly from the Browns Shoes horn because the plastic is somewhat softer and more flexible. I suspect this horn would be less likely to crack but it still isn't strong enough for my needs. In the end I bought a $5 metal shoe-horn from Moneysworth and Best. This horn is bigger than all the plastic horns and is clearly a professional, enterprise-class shoehorn. This horn is quite heavy and in no way could fit into a purse or briefcase. The hanging-hole is only large enough to admit the head of a nail, such as you'd use in a workshop on which you'd hang your tools. When using this horn there is no bending at all, just pure shoe-stretching, foot-sliding comfort. This horn was infinitely more expensive than the freebies but is worth every penny. After trying the various horns I have to say that, aside from the metal horn, the Long and Smooth horn wins for aesthetics, the Square and Thick horn wins for durability, and the Short and Flimsy horn fails to be of any use but wins in the compactness department. I recommend that anyone in need of a decent shoe-horn try getting freebies first, but be prepared to spend the real money when the freebies inevitably disappoint. True Tales from Customer Support: Your computer is set to "slow mode"
Back in the day, Duke Nukem 3D was the game to play (until Quake came out). This game required a fairly fast computer; The average computer was a 486 and Duke would barely run on it. The minimum spec was a 486 with 8 MB ram but this was too little for serious play, never mind high-resolution 640x480 graphics. A friend of mine and I had similar computers: 486 DX2 66 MHz, mine with 12 MB ram, his with 16 MB. Duke Nukem ran acceptably on my computer; low-res mode was fine but 640x480 was a little choppy. My friend called me one day to complain that Duke Nukem ran very slowly on his computer. We talked about RAM, using MS-DOS boot-disks to eliminate TSRs, HiMem.sys, and lots of other esoteric things, knowledge of which was de rigueur when dealing with DOS and memory-hungry games. We concluded that it wasn't the RAM and I suggested he bring the PC to my place. He did, and we disconnected my PC and plugged his into my monitor, keyboard, mouse, etc, and started the game. It was like watching Duke Nukem, only as a slide-show. The game was truly unplayable and this was surprising considering how well it ran on my computer. I checked his settings and could find nothing wrong with the setup. Then, on a whim, I pressed the seldom-used button on the front of the case. Back in the day computers weren't fast. The original IBM PC was a blazing 4.77 MHz. Eventually new computers were released with faster processors and RAM. However there was a large number of programs (mainly games) that relied on the timing characteristics of the PC: the games didn't had a timing loop that was tightly coupled to the speed of the processor. Run the game on a faster processor and the whole game goes faster. The aliens attack more quickly, the flight-simulator flies faster, and the ghosts chase Pac-Man more relentlessly. In order to accommodate the older software, many computers had a "Turbo Switch" which allowed you to slow down the computer. However as time went on, developers got better at writing games with proper clocks and users stopped wanting slower computers, so the Turbo feature disappeared. Pressing this button injected new life into the sluggish Duke Nukem and the game took off, full of pixellated-sprite glory and witty one-liners. I recommended to my friend that he disconnect the Turbo switch to prevent any future accidents. Me: Good Afternoon, Innitech Service dept, how can I help you? Angry Customer: This printer you sold me is crap! I can't get it to work with my ECP Parlell port! Don't try to tell me there's something wrong with my card, I paid good money in the US for this card! It's an expensive VESA-local bus IO card*! Me: Let's try some diagnostics. Me: Ok, let's verify the jumper settings on your IO card. Do you have the manual? Me: We sell hundreds of different products, there's no way we can have manuals for all of them. Customer: I blah blah blah and I know all the products I sell inside and out. Me: There are new products every week; there's no way we could keep up with them all. We're a retail store, not the manufacturer! Customer: Don't give me that! You should know all the products. Me: Ok, maybe you can download the manual from the internet. Customer: What?! The Internet? Don't you go trying to put a noose around my neck! That's nothing but a way for the government to control you! They will track everything you do! Me: ... Ok, well, what's the model number of this IO card? Me: Yeah, I'm looking at a graphic showing the card and all the labels. The ironic thing was this customer claimed to be an electrical engineer. In the end we didn't get his printer working so I suggested he bring it in, where we'd get it working for him (for free, since he bought it from us). He flew off the handle again, claiming it was too far to drive, and decided to see what he could do by himself. I saw him again a few months later, and asked how his printer was. He claimed that one of the wires was loose in the parallel connection on the printer and after re-soldering it it was fine. Who knows? It's either that or the men in black came to his house and sodomized his cats and he's just too embarrassed to admit it. * This story takes place in 1997. VESA local bus was a not bad technology that was popular on 486s but lost out to PCI. ** We didn't even sell him the IO card in question. 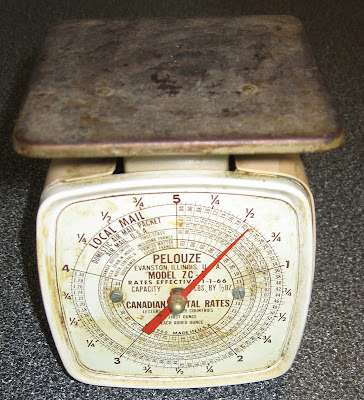 My grandmother had, among her myriad knickknacks, an old postage scale. I decided to clean it up. As you can see it was quite dirty and rusty. Unfortunately it was also mis-calibrated due to an accident in transportation. There was nothing to do but take it apart. I carefully unscrewed every screw and nut holding it together. I was a little surprised to see that the face of the scale was separate from the rest of the scale, but this makes sense since it would mean one scale could be made to weigh different things. I also imagine that the post-office could send out updated face-plates, but I'm not sure if this happened with this particular model. The mechanism of the scale is remarkably simple. It is basically a spring-loaded platform that has a toothed-edge which turns a gear. The gear turns the needle. This arrangement is rather tedious to tune, however, and I was not able to get the scale working 100% once re-assembled. 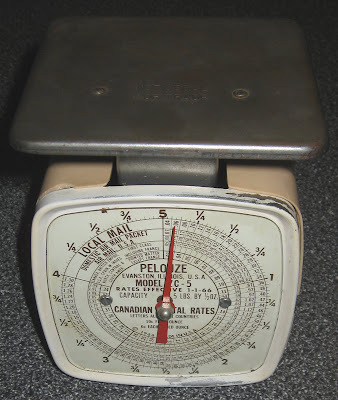 If you shake the scale it wiggles loose and is no longer zeroed. This article in the Toronto Star recounts how the Ontario Deputy Chief Coroner is calling for a ban on baby bath seats and bath rings. These products are designed to hold a baby upright in a bathtub. 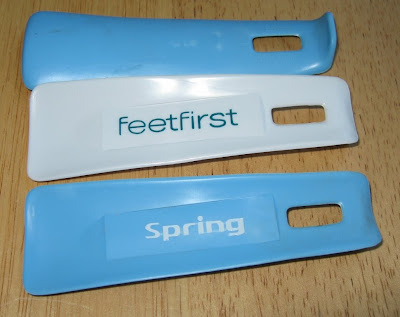 It seems that the products are not safe because sometimes a baby can climb out, or the suction-cups that hold the seat in place come loose, and the baby tips over and drowns. This is, of course, a tragedy. 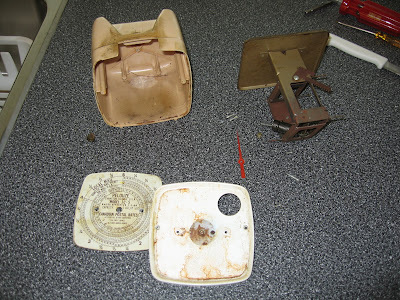 The report, released Monday, found there were 50 cases of accidental bathtub drownings between 1986 and 2004, and five of those cases were directly related to the use of infant bath seats. However without any context, the number 50 is rather meaningless. We are not told how many bathtub seats/rings are estimated to be in use, how frequently they are used, or even how many babies there are, and what their mortality rate in general. If I told you that 155,000 people die each day, you'd think that was a lot, until you realized that there are over 6 billion people in the world, and thus the death rate (on average) is 8.78/1000 per year. That's not so bad, in perspective. Given that we don't know how often a baby dies in a bathtub seat (at least from reading the article), the public can not form an informed opinion about the proposed ban. What if there are people who need these bathtub seats, because they can not simultaneously keep their baby upright AND wash the baby at the same time? If you have only one hand, this could be the case. Or maybe you have twins and want to bathe them together, to save time. In this case you could put them both in a seat, and bathe one while the other soaks. I'm sure you can think of lots of use-cases for bathtub seats that don't involve leaving the baby unattended. To the Toronto Star (well, it's a Canadian Press article, so who knows who wrote it? ), I say this: Give us meaningful data, or else you're just scare-mongering. Lots of things in your home can kill a child. This is always tragic. But if the government is going to ban a useful product, we need all the information we can get. So there is a guy who "sells computers" in a "shop" near me. I use these terms loosely because people rarely go into this shop, and when they do, nobody buys any computers. It may have to do with the salesman/owner. He doesn't rank highly on the customer-service-ometer. I went to his store once (big mistake) to try to buy a motherboard for a computer that was suffering from dementia. I am sometimes impatient and wanted to buy a motherboard that day; also I had done zero research because the onset of dementia was rather sudden and I needed this fixed ASAP. Consequently I did not have a specific motherboard in mind when I embarked on my quest; all I knew was I needed an AMD motherboard for my AMD processor. Me: What kind of AMD motherboards do you have? Him: What kind do you want? Me: Well, what do you have in stock? Him: We can order anything. Me: Yes, but what kind do you have in the store? Him: Just tell me what motherboard you want, and I can order it for you. Me: I want to buy a motherboard today, and take it home right away. Him: It takes 3 days to order. Me: Do you have any AMD motherboards in stock, right now? Me: What kind of motherboard can I take home today? Him: We can order any kind you want, just tell me which one. With this kind of service, it's no wonder that everyone I know who's been in there has come out saying "He's crazy!" Yet somehow his store stays open. If he isn't selling computers, what is he doing then? My theory is that his store is a front for a secret government research centre. His disheveled appearance, the random collection of parts in the store, and his total inability to communicate with a customer lead me to believe that he is a relic of the Harris government's attempts to eradicate poverty by cutting welfare and genetically modifying poor people to become super-soldiers, or undead zombies. It seems the music industry is trying to shut down their fans again. The National Music Publishers Association has sent a letter to the guitartabs.com site asking them to stop distributing guitar tablature. Guitar Tabs is a site where users can download tab files; I understand that generally these files are written by people who listen to a song, work out the notes on a guitar, then submit it to guitartabs.com for others to enjoy. Unfortunately for the music fans, this activity violates copyright law. Copyright law, at least in Canada (I have read the Copyright Act, but IANAL) specifically defines things like making guitar tab as making a copy. Copyright doesn't depend on the means of reproduction; even if the new work is different but very similar to the original work, and is derived from the original work, it doesn't excuse the copyright obligations of the "copier". If you read a novel, and write it out by hand, you are not allowed to distribute that copy, even if you make spelling mistakes or re-word a few sentences. Heck, you are not even allowed to translate a work into another language. You are not allowed to make a movie out of a copyrighted book nor sing a song with a similar tune as another song, even if you change the lyrics. To my knowledge these basic rules are in all copyright laws passed in any countries that signed the Berne Convention. Some people confuse the issue further when they consider the copyright of the author of the derived work. The derived work may be subject to the "copier's" copyright as well; consider a translation of one book into another language: The author of the original book owns the copyright for that book, but not the copyright for the translated book (assuming it was translated without authorization of the author). The copyright for the translation rests with the translator, however, since it is derived from a copyrighted work, the translator can not distribute it without permission from the original author. The author does not have permission to dictate when the translation will be distributed; the author can only dictate when it will NOT be distributed. When the copyright of the original work expires, the translator is free to distribute his work, and the this version of the work enjoys full copyright protection. Similarly, the authors of the guitar tablature can prevent others from copying their work, however the artists who wrote the songs in question (or, whoever owns the copyright) can prevent the distribution of tab. Should the NMPA stop guitartabs.com from distributing tabs? Well, the NMPA makes their money selling sheet music and tab. Under copyright law they hold the keys to this particular source of revenue, and a site like guitartabs.com presumably prevents them from making money on certain tab sheets. If you believe in copyright, then it follows that guitartabs is blatantly denying the NMPA of its due revenue. Sorry tab fans. Note: This post is meant to explain copyright law. It is not meant as an endorsement or condemnation of this law. JK Rowling is about to release the culmination of her life's work thus far, the seventh and final Harry Potter book. I figure now is as good a time as any to blog about her previous book, since most people will have read it by now. Spoilers may (well, ok, they do) follow. Book 6 was called "Harry Potter and the Half-blood Prince". The title refers to a mystery character whose identity is revealed at the end, who considers himself to be a "half-blood", that is, half-wizard, half-muggle. This lineage is apparently important to some wizards but not to others, given that muggles can have powerful wizard children and even pure-blood wizards can have weak offspring or offspring completely incapable of magic. However it would appear that the ability to use magic is somewhat genetic, giving lie to the books sometimes theme about how lineage is not important. On one hand, Rowling writes about how good Hermione is as a witch, while "evil" characters like Draco sneer at her "mudblood" status, but on the other hand wizards almost always beget wizards, while muggles practically never do, and even a squib has some magical ability, if only peripheral, such as the ability to see a Dementor. Given that genetics are seemingly important for magical ability, it would seem that Rowling's constant harping on the unimportance of lineage is contradictory. If magic defines power, and genetics define magic, then lineage is of the utmost importance. But I've only begun this post and already I digress. My main concern with book 6 is the untenable situation Harry finds himself in. The problem is that book 6 changed all the rules for magic. In the first books we are shown how magic works; you have to have the proper incantation, you need the proper wand movement, and you need the proper willpower. Incantation and wand movement were demonstrated in the first book when the children are learning to levitate items. It's only when they emphasize the right syllables and swish the wands the right way that the items float. Willpower is demonstrated in the third book, when Harry learns the Patronus spell, and in the fourth book, when Moody (actually Crouch Jr) mentions that if the whole class tried to use the killing curse he'd receive not so much as a bloody nose. However in the 6th book magic changes, and we now learn that magic is customarily done silently, in order to prevent people from anticipating your spells and counteracting them. This twist introduces some problems, not least of which is the battle between Harry and Voldemort in book 4. Voldemort has lots of willpower and personal strength but he speaks his killing curse aloud, despite having a good idea (we learn in book 5) that he desperately needs to kill Potter in order to fulfill some prophecy. Having tried three times now to kill Potter, you'd think he'd at least take a basic precaution such as sub-vocalizing the spell, but instead he speaks it aloud. The same can be said of the battle with the death eaters in book 5; on multiple occasions someone is rendered helpless simply by making them unable to talk in some fashion. The other aspect of the magic that makes Harry's position untenable is shown in the trick Dumbledore performs when they are trying to find the Horcrux. Dumbledore is able to analyze a cave, that hasn't been visited in years, and determine what kind of spells protect it. Now, he is a powerful wizard, but Voldermort is his rival and you have to assume that Voldemort is basically equal to Dumbledore; given Dumbledore's abilities it would seem a half-trained child like Harry would be completely unable to defeat him. This notion is reinforced when Snape and Harry duel at the end of book 6; Snape mops up with Harry despite Harry having all the anger and willpower he needs to pull off the most dangerous curses. Harry's been training for years and he can barely take care of himself. You might argue that Harry's done alright so far; I'd argue that he got by on a lot of luck. First, he didn't die as a baby not because of anything he did or because he was special, but because his mother protected him by giving up her life for him. This granted him a protection from the killing curse. Second, there's a convenient plot device which is that Harry, while an "under-aged wizard", can not be harmed (by Voldemort, anyway) while in the care of a relative. Handy, that. It means he gets the summers off, anyway. Third, he defeated Quirrel in book 1 because of the same protection he had as a baby, so that hardly counts. He defeated the basilisk because Tom Riddle happened to mock Dumbledore, and somehow Dumbledore sent magical items to help Potter because Potter stood up for Dumbledore. Killing a basilisk: cool. Doing it because you were totally unprepared for your battle but someone happened to send help, that you only received because you happened to get indignant about your schoolmaster's reputation: lame. In the third book nothing major happens except Harry misreads the whole situation and manages to unravel the mystery and save the day only with the help of a time machine. Luckily even Rowling knows what a mess a time machine can do to a plot so she broke them all in book 5. Harry only narrowly escaped in book 4, and that only after he (unwillingly) aided in the recovery of Voldemort. In book 5 Harry totally screws up the whole situation, leading to the death of a friend and his own near defeat until Dumbledore saves the day. In book 6 Dumbledore is killed and Harry is shown to be totally unprepared to deal with a true adult wizard who is ready for battle. Not a great track record so far. My only conclusion is that Harry can not possibly win. Harry has been a slacker all along, cheating on his homework, barely able to do potions unless he has help, and unable to perform spells without talking. He has yet to defeat a wizard in a duel, and while it's nice to emphasize non-violent solutions to problems, the only possible solution to a problem like Voldemort is to kill him (which raises another question, about whether killing Voldemort is grounds for an automatic life sentence in Azkaban). Yet Harry isn't up to the job. I will read book 7, when it comes out, but there had better be a good explanation behind Harry's victory, or I will be sorely disappointed. Assuming, of course, that Harry isn't the 7th (or 8th?) Horcrux, and thus fated to die anyway. Sweet Ginger Chicken! My Fedora install is only hours old, and I only JUST blogged about it, when it's already out of date. I just downloaded and installed Fedora 7. The installation is going well so far. All my hardware was detected, there were no problems partitioning the hard drive or installing a boot-loader that breaks Windows XP, or any other issues of that nature. The only problems I had were networking-related. My system normally consists of a server and a workstation, with the server sharing files through NFS and user accounts through NIS. Fedora 7 finally gets the workstation install 99% right for me during the install, with a couple issues. First, I didn't see any option for configuring NFS mounts at install. That'd be a nice thing to have because then the installer can set up any required daemons, such as nfs-lock. 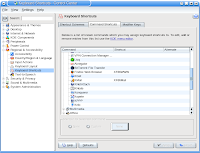 I ran into a problem logging in to KDE with my normal user because nfs-lock wasn't running. Second, and this is probably not a problem for most NIS users, there is no way to confgure the hosts file at install time. I don't have a domain and don't have a DNS server, so my NIS server's hostname has to be configured in /etc/hosts. This means that at install time, when attempting to contact the NIS server, the attempt is doomed to fail because there is no hosts entry for it. Annoying, but I can hardly blame Fedora for that. The other problem I had during the install is that Fedora changed the order of my network devices between version 5 and 7. This means that when I configured eth0 I was actually configuring the unused network port on my motherboard, instead of the one I meant to configure. Not a big deal but it would have saved me some troubleshooting if the installer had told me that there was no cable plugged into that card; this is something that's possible but it just neglected to do. Now things are working but I will need to spend a bit of time trying out the new, updated apps and restoring my settings. I never "upgrade" my installation of Linux because I don't want any downtime; instead I use a two-partition scheme, where the current OS is installed in one partition and the new OS in another. That way I can revert to my old installation if there isn't time to complete the new installation. It's also useful when I want to test out a new distribution. All in all the Fedora installer has gotten pretty good. Linux has come a long way from the days when an install gave you a text console, if you were lucky. Now the install works pretty well, and for the non-NIS/NFS-home case it works flawlessly. Compared to Windows, I'd say the installers are about on par with each other. Now if only nVidia would ship a proper open-source driver.... pfft... who am I kidding? Microsoft will open-source MS-Office first. Note: the price has changed. In fact it's gone up almost $100. WTF? I called Flight Centre to ask what happened. I was told that "all websites do this" and "the price is updated when you try to book, but the search results are not updated." Furthermore they pointed me to the minuscule text at the bottom of the search results page that says "These prices are for comparison only." Comparison to what? When you are searching for items based on lowest price, the only thing that matters IS the price. If the price is incorrect, which in this case it was off by 20%, how can you make a meaningful comparison? The weaselly text at the bottom of the page may absolve them from criminal liability for deceptive advertising, but this still stinks to me.